Preheat oven to 425°. Let egg whites stand 30 minutes at room temperature. On a lightly floured surface, roll dough to a 1/8-in.-thick circle; transfer to a 9-in. pie plate. Trim crust to 1/2 in. beyond rim of plate; flute edge. Refrigerate 30 minutes. Line unpricked crust with a double thickness of foil. Fill with pie weights, dried beans or uncooked rice. Bake on a lower oven rack 15-20 minutes or until edges are light golden brown. Remove foil and weights; bake 3-6 minutes longer or until bottom is golden brown. Cool on a wire rack. Reduce heat to 325°. In a large saucepan, combine cranberries, 1-1/2 cups sugar and water. Bring to a boil, stirring to dissolve sugar. Reduce heat to medium; cook, uncovered, 4-6 minutes or until berries stop popping, stirring occasionally. Remove from heat. In a small bowl, whisk egg yolks, 1/4 cup sugar, flour and salt until blended. Gradually whisk in 1/2 cup of hot cranberry liquid; return all to saucepan, stirring constantly. Bring to a gentle boil; cook and stir 2 minutes. Remove from heat; stir in butter and 1 teaspoon vanilla. For meringue, beat egg whites with cream of tartar and remaining vanilla on medium speed until foamy. Add remaining sugar, 1 tablespoon at a time, beating on high after each addition until sugar is dissolved. Continue beating until stiff glossy peaks form. Transfer hot filling to pastry. Spread meringue evenly over hot filling, sealing to edge of pastry. 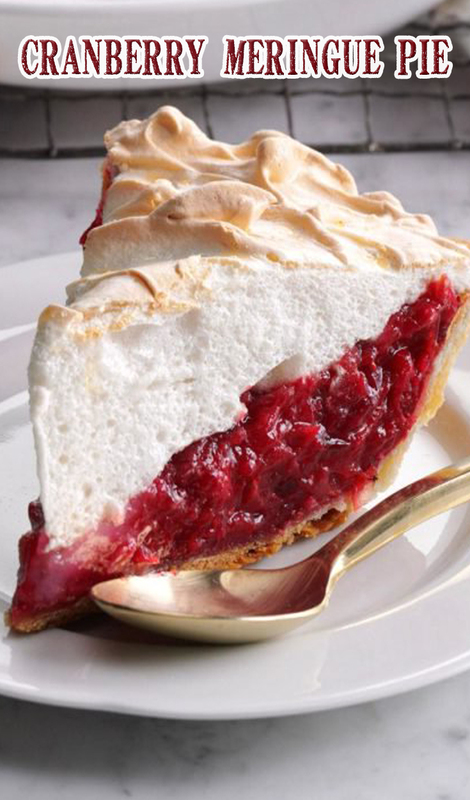 Bake 25-30 minutes or until meringue is golden brown. Cool 1 hour on a wire rack. Refrigerate at least 4 hours before serving.